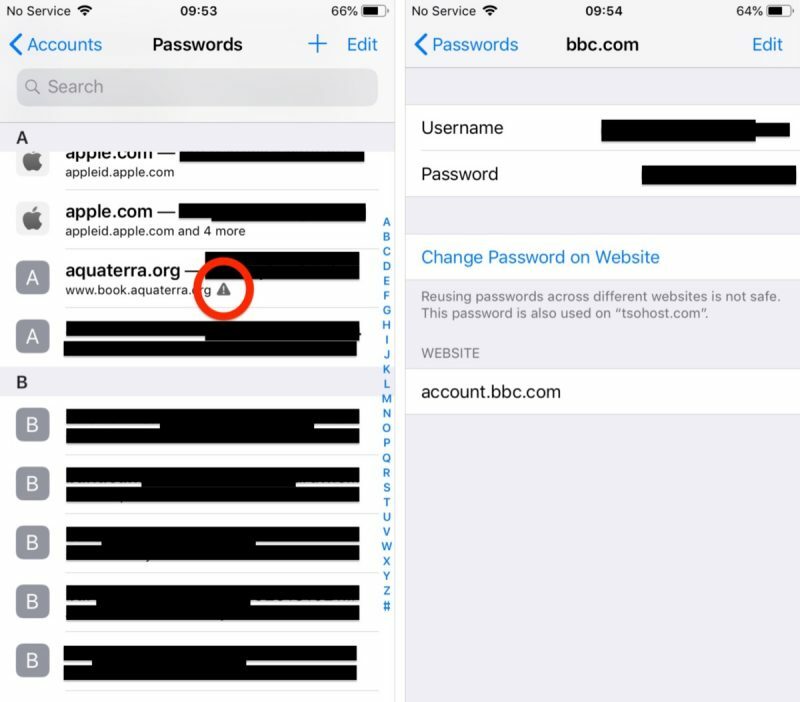 In iOS 12, Apple has introduced new password-related features that are designed to make it easier for iPhone and iPad users to create strong, secure, and unique passwords for app and website logins. In this guide, we'll show you how to use two of those features: automatic strong passwords and password auditing. Automatic strong passwords ensures that if you're prompted by a website or app to make up a password on the spot, Apple will automatically offer to generate a secure one for you. Password auditing meanwhile flags weak passwords and tells you if a password has been reused for different account login credentials. Here's how to use the two features. Launch Safari and navigate to the site asking you to create new login credentials, or launch a third-party app asking you to sign up for a new account. Enter a username or email address in the first field. Tap on the Password field – iOS will generate a strong password. Tap Use Strong Password to accept the password suggestion and save it to your iCloud Keychain. Pro tip: Next time you need one of your passwords, you can ask Siri. For example, you could say: "Siri, show me my BBC password." Siri will then open up your iCloud Keychain with the relevant entry, but only after you authenticate your identity with a fingerprint, a Face ID scan, or a passcode. Authenticate via Touch ID, Face ID, or your passcode. Scroll down the list of passwords and tap on any entries with a triangular warning symbol. Tap Change Password on Website to open the associated website and make the change. Note that the last screen shows you on which other websites you've used the same password. Pro tip: You can share passwords with other people directly from the iOS Password Manager via AirDrop. Simply tap the password field and an option to AirDrop the login will appear. 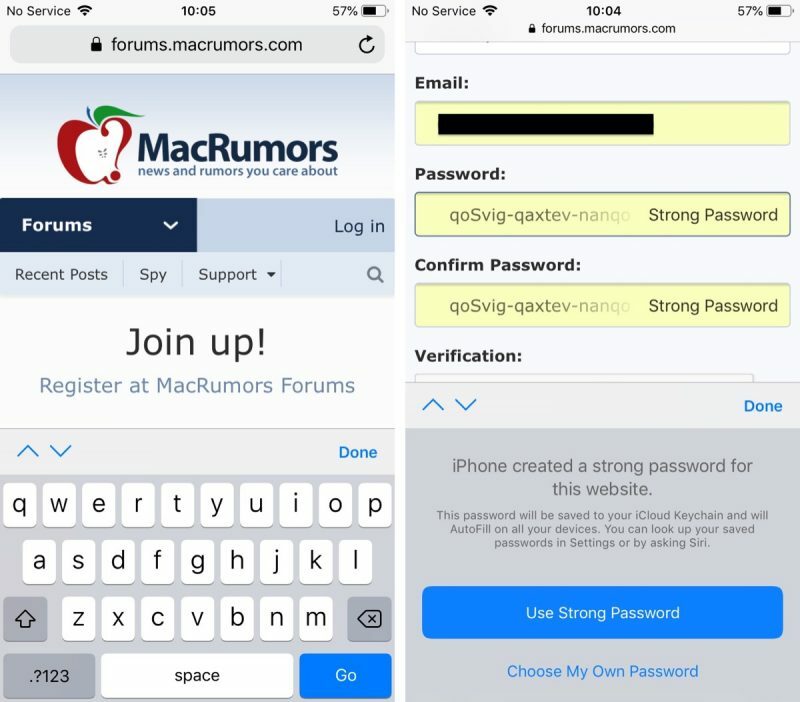 The login can be AirDropped to any device running iOS 12 or macOS Mojave. 1) At no time do you, or will you, know your password. So what do you do when you need to use that auto-generated password outside of Safari or something that has access into the Keychain? 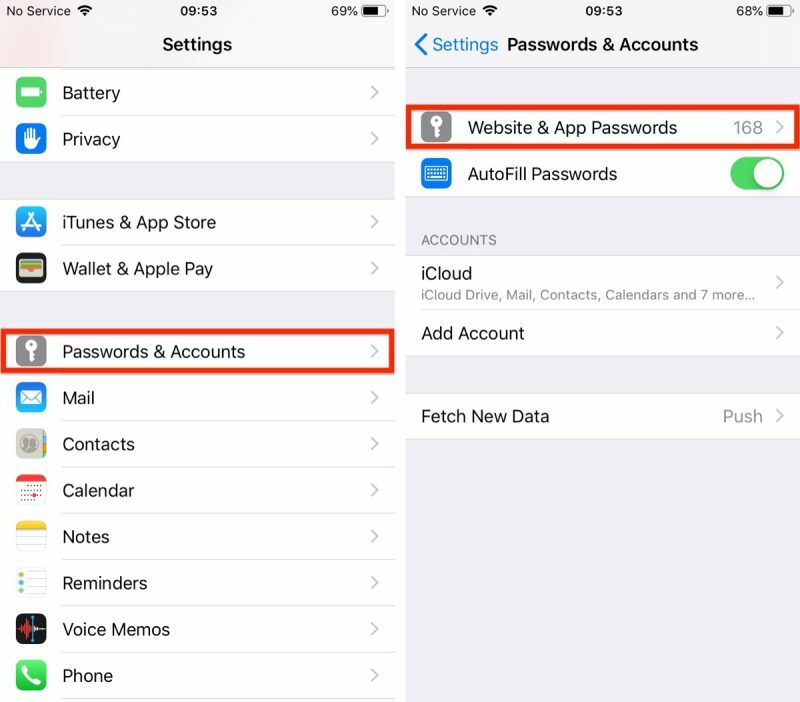 2) There is no means to access the saved passwords outside of fully connecting to your iCloud account on an Apple device. 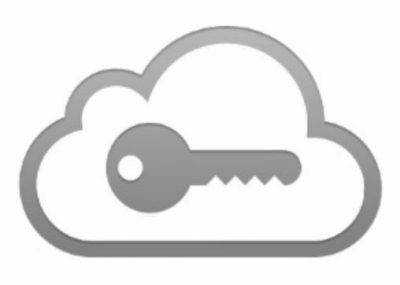 So if you lose/damage your iPhone (or iPad or Mac) and don't have another Apple device available you that you are able to connect to iCloud as a primary account you are completely locked out of EVERYTHING until you replace that Apple device with another Apple device. Clever on Apple's part but infuriating the moment the customer realises it. 3) Each time you want to access a password you need to use a credential that protects ALL of your other credentials. This means that primary credential is used more often making it more susceptible to "breach". Credentials are typical most at risk at the point/time of entry so the more you need to use it the more at risk it is. 4) It is all highly presumptive that everything is working right. The old version using 4 groups of 3 characters has a possible max of (62^3)^4 or 3.22x10^21 combinations. The new version using 3 groups of 6 characters has a possible max of (62^6)^3 or 1.83x10^32 combinations. This assumes that the groups are made up of any of the 26 lower case letters, 26 upper case letters and the 10 digits. If we eliminate i,I,l,L,o,O,1,0 that reduces to 54 possible characters and values of 6.14x10^20 and 1.52x10^31 respectively. I'm reasonably assured they're not going to get guessed by knowing that the dash is in a particular place. I prefer not to use automatically generated passwords because they eventually are reversed engineered. Really? There are plenty of easier and more likely vectors than “reverse engineering” the password generation mechanism. This is the world we’re heading to. Away from simple passwords that can be memorized and on to machine-generated passwords which are complex enough to thwart brute-force hacking. Look at SSL/TLS. Sure, these use certificates, but it’s a similar idea. Machine-generated, machine-stored, machine-entered authentication. Personally, I welcome it, as I would argue no one can reasonably generate and remember secure, unique passwords for all of the services they use. Can you edit that strong password? There are a lot of stupid websites that don’t take passwords longer than 10 characters or accept the dashes. If it doesn’t exist already, this will be a feature of future password managers. It would be trivial to screen-scrape and/or keep a database of password requirements, and generate a compliant password based on that knowledge. This has to be the dumbest excuse ever not using this. Really? Apple already does this ('https://twitter.com/_inside/status/959549503920660480'). Passwords only feel "excessively long and confusing" if you're trying to remember them. If you're using a password manager you trust and have on you all the time, you can ditch memorability as a factor and make them as hack-resistant as possible. Thank you MacRumors. I love this kind of articles. They are very helpful. I use 1Password. However, you can pull up passwords in your keychain if you want to know what it is, or edit the password. Very easy. If it’s stored in a password manager, I wouldn’t see the problem. The problem I see are the sites that have password length limitations like 8-10 chars and also don’t accept many non alphanumeric characters so the password is inherently weaker from the start. I hate websites like that. Even worse are the ones that give you no hint as to what you are doing wrong or they list rules but your generated password breaks a rule they don't mention. Another problem are sites that automatically cut the length without telling you. You generate a password, everything seems fine, you can't login. After resetting multiple times you figure out it was only taking the first 16 or so characters from the auto-generated password and ignoring the rest. There should be some standards. Websites must accept uppercase, lowercase, numbers and specific special characters and some universal maximum limit. That way password generators can easily generate passwords for any website. Also websites must clearly label password and username fields so a password manager can readily fill them. Plus allow pasting passwords. I also wouldn't mind if apps on devices like TVs all allowed a simple time limited access code sent to an authorized device and available for generation on their websites to login a new app. Long usernames and complex passwords are a huge pain when adding something to a FireTV or AppleTV. So is this Apple's way of telling us (by not telling us) that earlier versions of Safari generated passwords that aren't "strong"? They sure made a fuss during the keynote when it was introduced years ago that the password generated was secure. Apparently they don't think so anymore. Otherwise they wouldn't have upped it to five characters. Security is a moving landscape. Just about anything that was secure several years ago is at risk today. And generally one should be updating passwords on some sort of periodic basis in addition to uniqueness.